You’re in for a fun scare when Sony Pictures Home Entertainment unleashes GOOSEBUMPS 2 debuting on Digital and available via the Movies Anywhere App on December 25 and coming to Blu-ray and DVD January 15. Slappy the devious ventriloquist dummy returns to run amuck, in this second installment of the family-friendly franchise based on R.L. Stine’s beloved book series. Standing in Slappy’s way is a terrifyingly talented cast including Wendi McLendon-Covey (The Goldbergs), Madison Iseman (Jumanji: Welcome to the Jungle), Jeremy Ray Taylor (It), Caleel Harris (Castle Rock), and Chris Parnell (Rick and Morty), with Ken Jeong (Crazy Rich Asians). 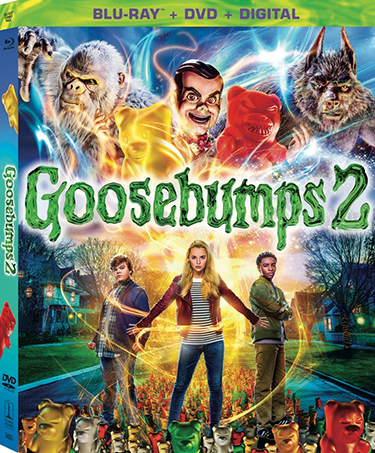 The GOOSEBUMPS 2 Blu-ray, DVD and Digital bonus features include a gag reel full of hilarious hijinks, three all-new deleted scenes and five featurettes. 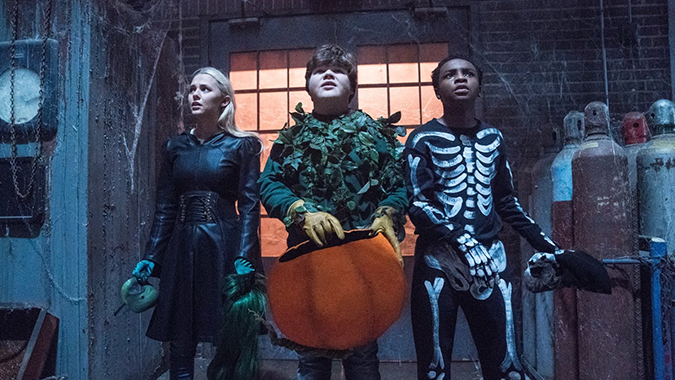 Between the chills, thrills and goosebumps, watch the cast get a case of the giggles in the “Gag Reel.” Dive deep in “Thrills & Chills- The Making of Goosebumps 2” with Madison Iseman, along with behind-the-scenes footage and interviews with the cast and crew. “Meet the Monsters” gives fans a sneak peek of how the scary creatures were brought to life. In “Slappy’s Audition,” watch what happens when Slappy auditions for the role he was born to play. In “Science with Slappy,” enter the Slapatory where Madison, Jeremy and Caleel join Slappy for some electrifying experiments! And get ready to sing along with three hilarious “Slappy-oke” songs. Who knew dummies could sing? Based on the beloved Scholastic book series by R.L Stine, GOOSEBUMPS 2 was directed by Academy Award-winner Ari Sandel (2005, Best Short Film-Live Action, West Bank Story) from a story by Rob Lieber and Darren Lemke and screenplay by Lieber. The film is produced by Deborah Forte and Neal H. Moritz and is executive produced by Timothy M. Bourne and Tania Landau. GOOSEBUMPS 2 is a Columbia Pictures, Scholastic Entertainment Inc./Silvertongue Films, Inc and Original Film production. The Movies Anywhere Digital App simplifies and enhances the digital movie collection and viewing experience by allowing consumers to access their favorite digital movies in one place when purchased or redeemed through participating digital retailers. Consumers can also redeem digital copy codes found in eligible Blu-ray and DVD disc packages from participating studios and stream or download them through Movies Anywhere. Movies Anywhere is available only in the United States.